In our classroom last week we were busy learning about our names and our character trait “acceptance. We read “Chrysanthemum” by Kevin Henkes to launch a discussion on both of these topics. This classic is a wonderful way to celebrate meeting new friends and learn about accepting others’ differences. Chrysanthemum is full of so many wonderful learning opportunities! Synopsis: Chrysanthemum thinks her name is absolutely perfect. That is until she goes to her fist day of school and the other girls tease her about her long name. “It scarcely fits onto your nametag.” “She’s named after a flower.” “Let’s smell her.” Poor Chrysanthemum. Will she ever love her name again? We celebrated our character trait “acceptance” by reading Chrysanthemum and talking about how we are all unique. Think before you speak. Am I saying kind words? Let’s look at each other. Do we all look the same? We discussed physical differences. How else are we different? We also discussed other ways that we are different. Differences aren’t always physical. We even think differently. We talked about how we are all unique but the most important thing is that we are all human! We also used this story to talk about names and extend our name practice by building name flowers. 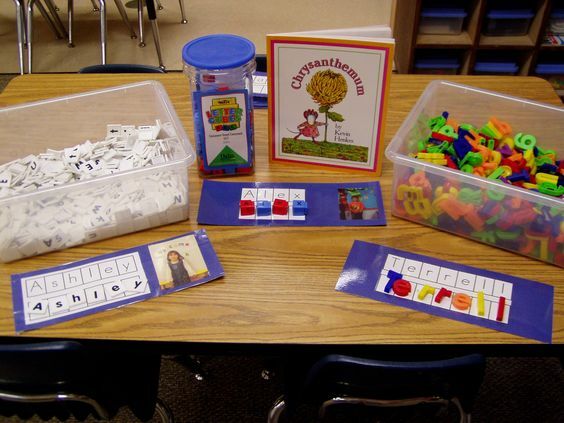 We are going to continue practicing names with these fabulous name activities found at Teaching Heart Blog. 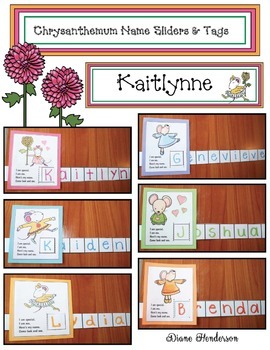 And because our little ones love everything to do with their names in the beginning of the year, we added this fun little Chrysanthemum name slider to the mix of name activities. Check out this Chrysanthemum read aloud at Story Time at Awnie’s House. These are lovely activities for the beginning of the year. Or any time.